As it's from an issue which hasn't technically come out yet. Yup. A 30 foot tall Death's Head and Tony Stark in a Gladiatorial Arena, on an alien planet, with a battle about to begin. You see, back in the summer Iron man played an important part in allowing the Avengers and X-Men to destroy The Phoenix. Well... it had to be done. There was global peril, and... stuff. Still, not everybody was happy about that. Like The Voldi. An alien race which just happened to worship The Phoenix as their God. They're really not happy about it. And as Tony Stark decided to start going out into space (He is now a member of the Guardians of the Galaxy, believe it or not), and had the misfortune to encounter The Voldi, he was arrested and tried for Murder. Which, frankly, is a little work of genius. And, yes, rabid fanboys. Calm down. It's by Greg Land. And I care not for your complaints of lightbox tracing. This is brilliant. And a brilliant Cover always remains a brilliant Cover, regardless of your other thoughts on an artist. The current Death's Head mini-resurgence may prove to be little more than a blip in the long term, but I'm loving it while it lasts. Iron Man #8 is out on the 17th April. So by my count there are at least three versions of DH running around 616 now. There's the pre-Transformers one who appeared in S.W.O.R.D. 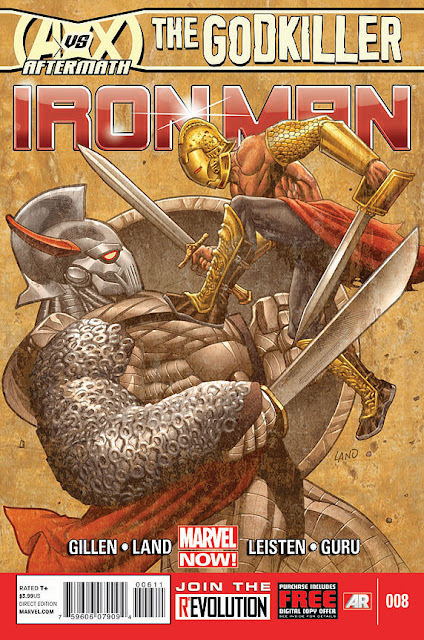 and now Iron Man, there's DHII who showed up in Captain Britain and MI:13 and then the human-sized one from Avenging Spider-Man. One could argue that since DH has been beheaded and survived, there may even be two as a result of that Spider-Man encounter. I don't know what my point is, but it would be fun to see them all team up. That is a nice image. 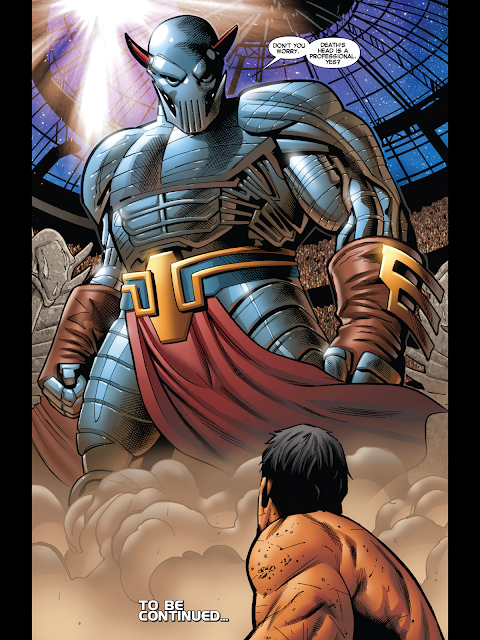 I've never actually read a Death's Head comic, when I've seen him in 'clips', his speech puts me off. Still not too keen on this design, to be honest - no one draws DH quite like Senior. Still, great to see he hasn't been forgotten!